Today I'm bringing you books by two of my favorite people. Robin is someone I routinely brainstorm with. We also frequently read each other's books before our editors see them. Randy is one of the nicest people I know and he writes AMAZING legal suspense. I told him last month he's the reason I don't write legal! Injustice for All (one I read early): A federal judge lies bleeding on his office floor, betrayed by a most unlikely source—people who helped him bring criminals to justice. Now, why would someone working for the FBI need to disappear after witnessing this crime? When Remington Wyatt sees her godfather’s murder, she recognizes the killers and knows it’s only a matter of time before they come to silence her. She must do the only thing possible to stay alive . . . run. FBI agent Rafe Baxter is serious about his career, and solving a cold case involving a federal judge’s death puts him in line for the promotion he so desires. But the case leads him to the small town of Hopewell, Louisiana, where some secrets seem inextricably hidden deep within the bayou. The Last Plea Bargain: Plea bargains may grease the rails of justice, but for Jamie Brock, prosecuting criminals is not about cutting deals. In her three years as assistant DA, she’s never plea-bargained a case and vows she never will. But when a powerful defense attorney is indicted for murder and devises a way to bring the entire justice system to a screeching halt, Jamie finds herself at a crossroads. One by one, prisoners begin rejecting deals. Prosecutors are overwhelmed, and felons start walking free on technicalities. To break the logjam and convict her nemesis, Jamie must violate every principle that has guided her young career. But she has little choice. To convict the devil, sometimes you have to cut a deal with one of his demons. I would love to go to as many US states as I can. One day, I want to see all 50 states. Is it bad that I don't really have a bucket list? Lol I probably should, but though I've had plenty of tribulations in my twenty years, I have been abundantly blessed. That being said, music has always played a crucial role in my life. A dream I know that will never happen for me is to be on Broadway! So I guess one thing that I hope can happen is to just stand on a Broadway stage : ) Like the real Broadway, NYC! Lol I'm going in January! THe books sound great. Thanks again for doing this, Cara! New York...from Niagara Falls to NYC! Only time will tell if I can sell the family on it! Want to go to Hawaii. Someday the finances will work that out! Love the chance to win new suspense reading!! My favorite genre. I would love to see the Mutter Museum! I don't really have a bucket list, but there certainly are things I would love to be able to do. In 2013 We want to do a road trip to a niece's wedding, with our college age daughter. We are very much looking forward to it. I love legal suspense - my brother is a lawyer, so it is even more interesting. I don't have a bucket list but I do have some projects I hope to accomplish and complete this next year. A little boring, perhaps, but they will be things I enjoy and I just hope and pray I will be able to complete them!! Merry, I am so with you. Hopefully one of my next books will be set there. Fingers crossed! Enjoying reading all your items! I love Robin Caroll's books. 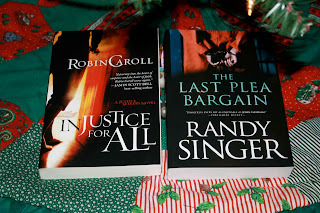 I haven't read Randy Singer. I haven't read either of these books and they look enticing! I don't have a bucket list, but one thing I'd love to do is pay off my entire mortgage. That would take a miracle! Both of these books look really good; I like to read legal thrillers. Thanks for giving away copies of these books. Would love to go to Hawaii. Have wanted to go for years. This has been a life long dream! I don't have a bucket list but I would like to go to the last 10 or so U.S States I haven't been too. Both of these sound wonderful. Authors both going on the to read list. Thank you for sharing. Blessings. Guess I don't really have a bucket list either... I would love to get married! No significant other at the moment, so I don't see that happening! I love all books but suspense/thriller/mystery I love the most! Especially if they're Christian lit as well. As for my bucket list, I'd really love to travel Europe, especially Italy and Spain! Go on a hot air balloon ride! I have always wanted to go to Montana. I think one of mine is to develop a legal thriller i can sell. Maybe it's time to try that. Cara, I know you can write a legal thriller! I enjoy reading both of these authors! My son is going to Spain for a semester this fall, and I think this could be my best chance to visit Spain. I'd love to go to Spain, France and Italy someday. Go to Ireland! And ride the whistle stop train in Alaska. Casey, I need to go to Italy for on site research for the book I'm writing. If I can actually schedule it, it would be so fun to have you go, too. Get the kids to Disney! :-) This momma has never been either. I'm currently working on my undergrad in Government & Public Service. I'm a huge fan/supporter of Frm. Ark. Governor Mike Huckabee. It's on my bucket list to meet him. Everytime he is near where I am at or live, I can't go. Hopefully, next year I can meet him!